When head injuries are suspected after a car crash, immediate medical treatment is of utmost importance. 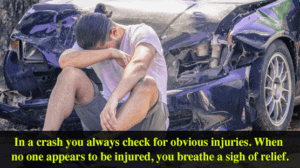 Although signs of head trauma can be readily apparent immediately after a car accident, mild head injuries may not result in any major symptoms and may even be confused with symptoms of other types of medical conditions. But symptoms may indeed show up well after the fact that could indeed be a delayed result of the accident. These may include blurred vision, confusion and disorientation, loss of memory and lack of concentration, headaches, dizziness, nausea and vomiting. If you or a loved one have been involved in an automobile accident, and the extent of the injuries was not fully apparent at the time of the accident, please be aware that you still have legal recourses available, and the skilled and experienced attorneys at the Fenstersheib Law Group, P.A. have been helping automobile accident victims for more than three decades. Let us put that experience to work for you – we stand by our long history of compassion, integrity, and tenacity in bringing justice for the injured. Call us today, toll-free, at 1-800-TellRobert, for a free initial consultation to determine your legal rights. Our phones are answered 24 hours a day, 7 days per week. Home > General Blogs > Is A Head Injury Always Immediately Apparent After A Car Crash?